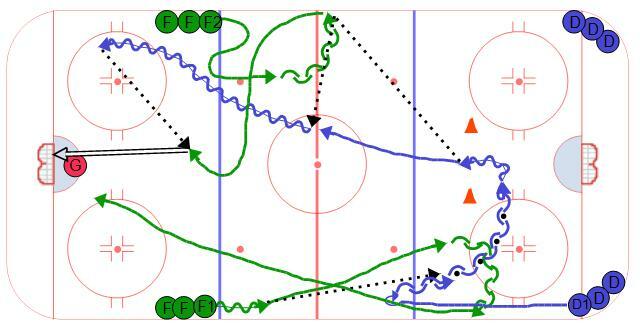 This hockey drill ia variation to the first Swedish Transition Series Drill. In this variation the defense work on making the neutral zone pass and then skating into the open ice to receive the puck back and leading the rush into the zone. Instead of a 2 on 0, the players are attacking in a 3 on 0. F1 should drive hard to the net and F2 should be the trailer and be available in the high slot. In this situation F2 should have the presence of mind to replace D1 on defense in case of a turnover.